The changing of the seasons and the loss of these remarkable individuals remind us that change is constant. Even if we’re fortunate enough to live 99 years—as our beloved mayor did—we each only have a short time on this earth. What we do with our time and talent, and how we effect change, is up to us. This fall, our City must undergo change as part of the 2019 budget process. On October 5, the City will release its proposed budget, which must close a projected deficit of more than $7 million. Closing that gap will require sacrifices, difficult choices, and change, but it's the reality we face if we want Evanston to remain a vibrant, livable and fiscally sound community in the years to come. Change is also happening in the Evanston skyline. Construction has already begun on residential developments at 811 Emerson St. and 1450-1508 Sherman Ave., and will soon begin on senior housing developments at 1815 Ridge Ave. and 1727 Oak Ave. Along with these new structures will come hundreds of new residents to patronize businesses, generate tax revenue, and contribute to the economic vitality of our city. Evanston's vitality was evident this summer at the Out of Space concert series, which I would love to become an annual tradition in our city. The series, presented by Evanston SPACE, brought 10 fabulous outdoor music events to three Evanston venues: Canal Shores Golf Course, Temperance Brewery, and the intersection of Dempster Street and Chicago Avenue. While Dempster and Chicago enjoyed new music, another Evanston intersection will soon be home to a new community gathering place. Main Street and Dodge Avenue is the site of the new Robert Crown Community Center, Ice Complex and Library. Work is already well underway—as you can see on the project's webcam—fulfilling a vision of the community since Mayor Morton was in office. While positive change is happening in our neighborhoods, it doesn’t always feel like it. Evanston and neighboring communities—and our country for that matter—continue to grapple with gun violence. Although major crimes have decreased by 39 percent in Evanston since 2007, translating into 1,200 fewer crime victims each year, incidents like the recent gang-related shooting on Custer Avenue and Howard Street and the tragic homicide of a Northwestern student on Clark Street in Chicago remind us that we have much work to do to enact sensible gun safety laws and address issues of poverty. Although the challenges we face this fall may seem daunting, ours isn't the only generation to face them, and we likely won't be the last. Mayor Morton believed in service, civility, and progress, but most of all, she believed in Evanston. I'm confident that by following her example and working together, we’ll be ready for whatever changes the next seasons may bring. Early voting for the Gubernatorial Election will take place Monday, October 22 through Monday, November 5 at the Lorraine H. Morton Civic Center. Voting hours and more information can be found on the Evanston City Clerk's webpage. If you're not already registered to vote, please do. You can register to vote at all early voting sites and at your polling location on Election Day, Tuesday, November 6. 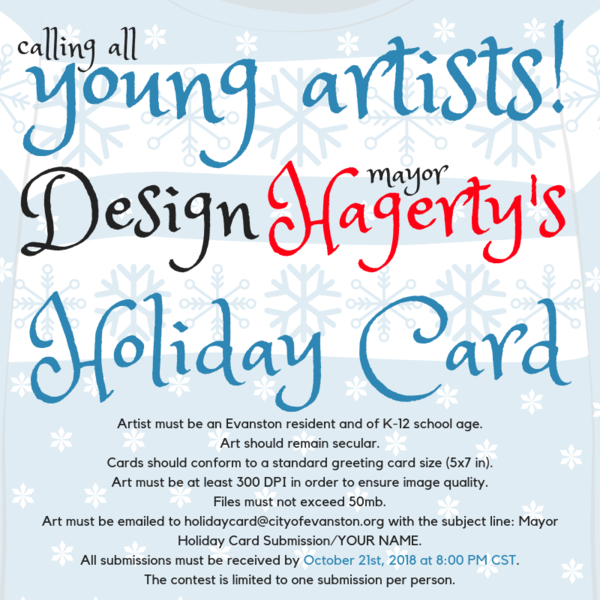 Young Artists: Help Design Mayor Hagerty's Holiday Card! The excitement of the holiday season is still a few months away, but preparations are already beginning. This year, I'm seeking a talented young artist to design my holiday card. The winning artist will receive citywide recognition for their holiday design. We're fortunate to have so many talented young artists in our community. I look forward to seeing your creative submissions and celebrating the holiday season with all of you. 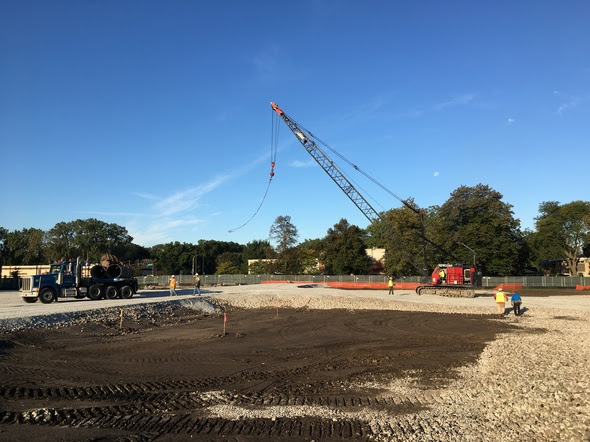 Work is well underway on the new Robert Crown Community Center, Ice Complex and Library at Main Street and Dodge Avenue. My thanks to Friends of Robert Crown and all who've supported this exciting project many years in the making. You can stay up to date on the facility's progress by subscribing to weekly email or text message updates or visiting the project webpage. 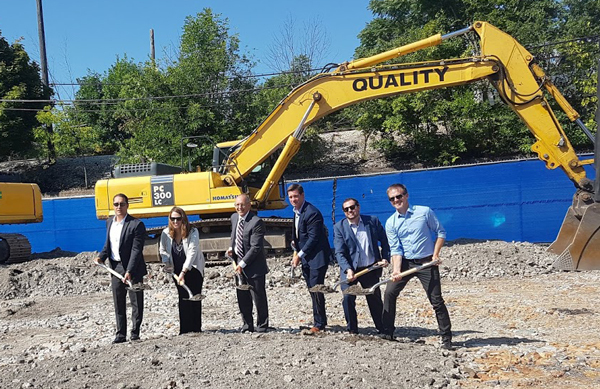 In August, ground broke at 1450-1508 Sherman Ave., a 15-story mixed-use development with 268 dwelling units and 6,800 square feet of commercial space. Although I share many fond memories of time spent with family and friends at Prairie Moon and Tommy Nevins, which previously inhabited this site, I'm excited for the more than 400 people who will soon call this building and Evanston home, as well as the economic support they'll provide to downtown businesses and our tax base. The project is expected to be completed in spring of 2020. Meanwhile, Prairie Moon recently celebrated the grand opening of its new location on Chicago Avenue south of Church Street. I look forward to many new memories in their beautiful new space. Keep up to date on planned developments in our community on the City's website. More Evanston residents will have access to Divvy bike share as part of the newly expanded Divvy for Everyone (D4E) program, which offers $5 annual memberships to income-eligible community members. Evanston is a bike-friendly community, and it’s important that all of our residents can access and enjoy this healthy, convenient and sustainable transportation option. 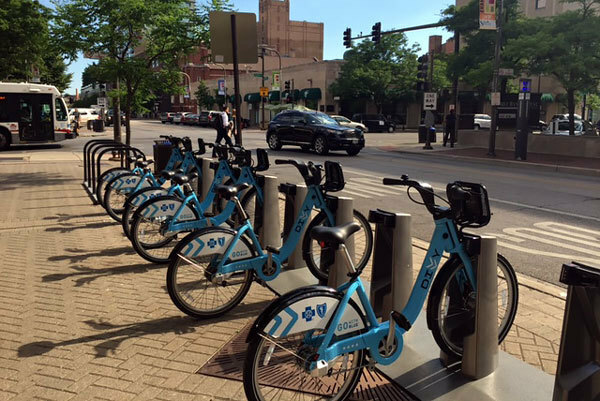 Last month, the City Council approved the purchase of three additional bike stations at a discounted price to expand the Divvy service to west and northwest Evanston. 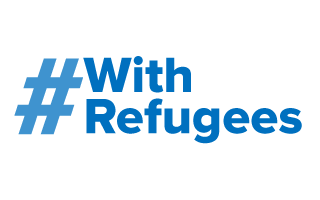 Thanks to a new revenue sharing agreement, it is anticipated that this program will operate at no cost to the City in 2019. In September, I was proud to support the United Nations High Commissioner for Refugees’ (UNHCR) "Cities #WithRefugees" campaign, joining more than 60 mayors across the globe in standing up for those fleeing violence, persecution and natural disasters in their home countries. Thank You for Attending the CommUNITY Picnic! 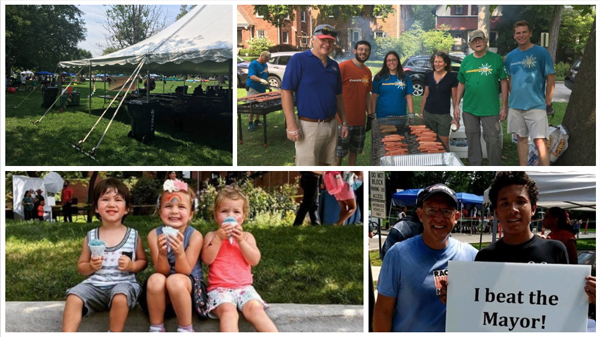 We had a great time celebrating all things Evanston at the annual CommUNITY Picnic at the end of August. Hundreds of Evanstonians came together to celebrate the back-to-school season with food, face painting, games, live music and entertainment. A few of them even beat me in basketball. My thanks to all of the volunteers, staff, performers and participants who made this such a special and enjoyable day. Click the button below to see photos from the event. ETHS students will host a gun violence forum this Wednesday, October 3, 7 p.m. to 8:30 p.m., featuring speakers from St. Sabina Church, March for Our Lives and student activists. Please attend and join the movement to bring about sensible gun safety laws in America. Work up a sweat with officers of the Evanston Police Department and local fitness trainers as part of "Five-0 Fitness," a new community outreach initiative. The program includes a 60-minute workout followed by healthy eating tips and an opportunity to chat with police officers. 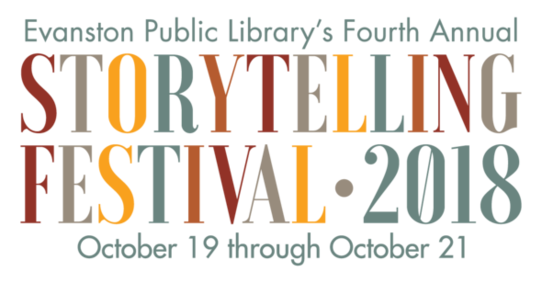 Join the Evanston Public Library for its 4th annual Storytelling Festival October 19-21 at venues throughout downtown Evanston. Storytellers from near and far will congregate in and around the Evanston Public Library to share their stories with local audiences. Events are free and all are welcome.